The three main roles are for the women in the drama, and we also get ultra-committed performances of both Chrysotemis and Klytämnestra. To an extent that I have never seen before, Erin Wall establishes Chrysotemis’s goal to create life out of the tumult of her family’s predicament as equally urgent as Elektra’s quest for vengeance. 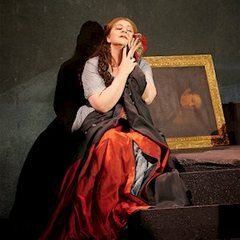 I associate Ms Wall with more ladylike roles, such as Arabella and the Countesses in Le nozze di Figaro and Capriccio; this role catapults her to a whole new level. Susan Bullock gave us a riveting, visceral Elektra in 2007, and now she does the same with Klytämnestra. Here is proof that a soprano can do justice to a role we associate with mezzos or even altos. Even though the two main men’s roles are rather brief, one wants singers who match the women, and Wilhelm Schwinghammer as Orest and Michael Schade as the tipsy Aegisth are more than usually strong. Then there are the 11 comprimario roles, all well done. It is nice to see a member of the Ensemble Studio, Lauren Eberwein, making such a fine impression as the sympathetic Fifth Maid. The 20-member chorus proclaim their joyous cries of “Orest!” from a gallery high up in the auditorium, giving an effect both surprising and mysterious. And once again Johannes Debus proves his worth as we celebrate his 10th season as COC Music Director. James Robinson, the director who created the production in 1996, has returned for this revival (another director took it over in 2007), and he has seen fit to re-think it. Instead of an expressionist approach, “with exaggerated and abstract shapes and gestures”, he has “concentrated...on the domestic situation of Elektra with a more restrained palette”. (Quotes from the Director’s Note.) He certainly has succeeded in making the stage picture more restrained, which is just what this opera does not need. The program has photos from the 2007 performances and the main differences are in the costuming. In 2007 Elektra was in a rough-hewn rawhide garment with short, spiky hair, while this time she is in a well-fitted gown made of glittery material, and her hair is long and decently kept, while in the libretto she describes her own hair as versträhnt, beschmutzt, erniedrigt (“disheveled, dirty, degraded”). Klytämnestra was adorned with furs but now wears a restrained black gown. Different lighting also dampens down the angular set’s dynamic presence, although great cones of light beam effectively down from the fly tower. Fortunately the director’s domestication doesn’t hamper the performances which are the driving force of the elemental score and dramatic structure of the opera. One of the great nights at the opera. I look forward to seeing it again. Historical footnote: The COC production of Elektra in January, 1983 (Jan 21 to be exact), directed by Lotfi Mansouri, featured the first use of surtitles. I don’t know whether surtitles deserve to be called revolutionary, but they certainly have seeped into the universal opera-going experience.